Perhaps the most important question that should be asked of any new work of art is this: So What? A work can do all sorts of things, some of them even unprecedented, but unless doing so serves a purpose, the accomplishment may be no more than a stunt. So what if it brings together elements rarely or never seen together: two subjects, a technique and a theme, high and low culture? Recognition of the achievement should always be followed by the sober reply: So What? Fortunately, the humorous, yet ultimately tragic, composite prints of Scott Tsuchitani, at UMOCA throughout July, pull together disparate materials for gently explosive effects that answer the question in several ways. The title of the multi-plate etching “Safety in Silence, or the Elephant in the Room Never Forgets” stitches together two idioms: the elephant in the room, symbolic of something not being spoken about, and the elephant’s unfailing memory. The title creature then appears in a traditional Japanese American living room, which it paradoxically shares with three generations of a family celebrating a new child. The juxtaposition of memory and the traditional family makes a point elaborated upon in the soundtrack of the video that accompanies the prints. California’s Tule Lake Relocation Camp, and what happened to those who were confined there against their wills during World War II, is not forgotten; it’s just not spoken of. What emerges from these several collisions, of language and image and media, is an understanding of the depths of shame, where remembering is as mandatory as silence. In other prints, like the digital trio “Boys Love Baseball,” “Mmm Milky,” and “ ….” Tsuchitani has placed the faces of now-ubiquitous Japanese characters—Hello Kitty, Ultraman, Astro Boy, and Peko-Chan, as masks on the heads in documentary photos. Seventy years ago (the black-and-white images recall the date), Japanese were demonized in America; today, fans of Manga, Anime, and collectibles of every sort can’t get enough of Japan. And, the artist might add, even as Muslims have replaced them as the world’s purported evil. The heart of Internment, which includes eight of these deceptively humorous, ultimately tragic prints, is a film the San Francisco-based Tsuchitani made in 1994. “Meeting at Tule Lake” (pronounced TWO-lee) memorializes a reunion in 1991 of veteran internees. Made when more of them were still able to testify, it includes stories from aged men and women who, when young, in spite of having been born in the United States and never even having visited Japan, were forced to abandon their homes, businesses, schools, and lives and move into isolated places like Topaz, the relocation center near Delta, and Tule Lake, a few miles from the Oregon border in remote northern California. Eventually, those who survived were released, but nothing ends there. Restitution came late or not at all. Families remain divided. And the injustice stands, captured by the ironic story of one man who, upon his release, found a bell and rang it until it cracked. 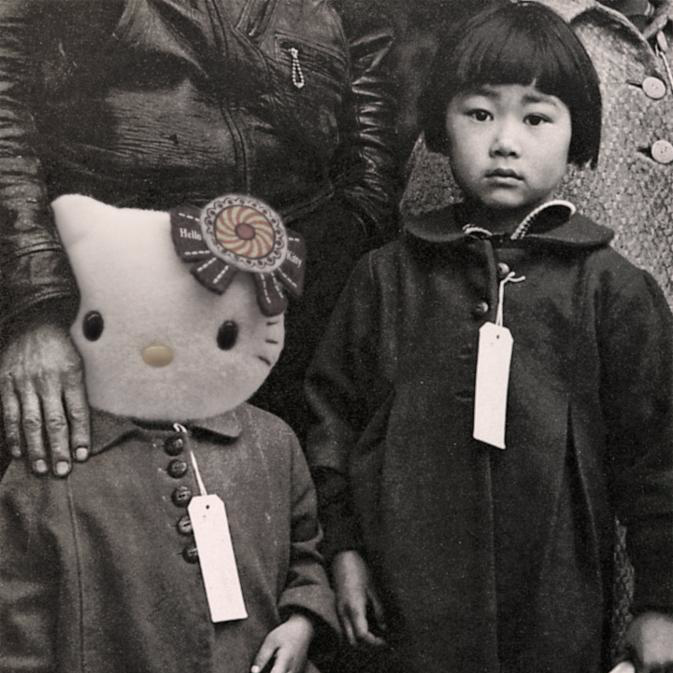 Scott Tsuchitani 槌谷スコット: INTERNMENT 抑留 is in the Utah Museum of Contemporary Art’s Codec Gallery through August 1.